Seize the Play® at Camp! Is your dog getting the exercise and socialization they need? Treat your dog to a fun and active day at Camp and bring home a happy and pooped pooch! Camp Bow Wow® doggy day care services are designed to improve your pup’s quality of life in a safe, fun, and nurturing environment. 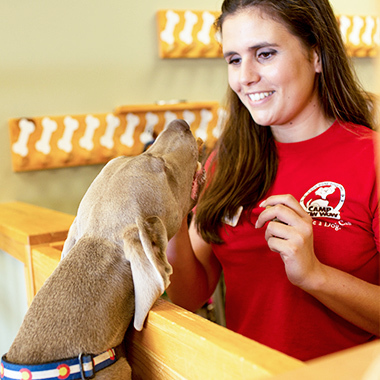 We provide both dog and human interaction that benefits mental stimulation and socialization. Our spacious play areas allow for maximum fun and the chance for your four-legged family member to burn off some of that pent-up energy. It’s true: dogs love Camp. This is evidenced by the fact that so many of our Campers get excited at the mention of C-A-M-P. They pull pet parents right up to our door and can’t wait to join the fun. We can give you peace of mind knowing your dog isn’t cooped up at home along with many other benefits our day care services have to offer. Up to 5 hours. Must be from the same household. Must be from the same household. Day Care packages do not expire.